Viola Webb was a person who was full of surprises. On the surface, she was a perfect lady. Beneath her sweet smile lay stubbornness, passion and a love for sports, horses and rodeo. But most of all, Viola loved Jesus Christ, missions—and Diet Dr Pepper. Her love for Jesus and passion for missions fueled her as she served Kansas-Nebraska Southern Baptists for 25 years. From 1957 to 1982, she served as executive director of Kansas-Nebraska Woman’s Missionary Union. After her retirement, she was active in her church, First Southern Baptist Church in Topeka, until her health forced her to step back. A Texas native, Viola was the oldest of eight children and had many of an oldest child’s responsibilities. She worked with her father in the fields during the week. Then on Saturdays, she did the ironing for her mother, using “sad irons” heated on a woodstove. As the oldest child, Viola often found herself having to “break the apron strings.” For example, she accepted Christ at age 9 in her family’s outhouse. Why make such an important decision in a place like that? Viola thought her parents would think she was too young to make that decision, so she went to the outhouse for privacy. As a young girl, Viola felt God calling her to serve as a missionary nurse in Africa. However, her father, Clay Middleton, said he’d rather take Viola to the cemetery before he took her to college to study to be a nurse. It appears her father was very reluctant to let his first child leave home. Although Clay Middleton did not want her to go to Africa, he still had a profound influence on her life. He taught her to respect all people, regardless of their race or economic status. As a schoolgirl, Viola had a friend who was like a big brother to her. Collins Webb carried her books and defended her from bullies. Collins later moved away. However, he came back to see Viola, and they went to see her boyfriend, who was ill. But the boyfriend quickly became history, and Viola and “Preacher-Boy” Collins began making plans for their future together. Once again, Viola found herself struggling to loosen the apron strings from her close-knit family. After only a three-week engagement, Collins and the 17-year-old Viola were married on July 27, 1930. The next morning they left for west Texas where a relative of Collins lived on an oil lease. He and his wife wanted to go on vacation but needed someone to tend the oil wells. So Viola and Collins spent their honeymoon doing that. The living quarters consisted of three separate buildings, and the newlyweds enjoyed teasing by locking each other out. Soon after that, Collins and Viola headed off to Howard Payne College in Brownwood, Texas, so he could be trained for the ministry. Viola worked to provide financial support and helped Collins, who suffered from an eye problem, with his studies. Although her calling to serve in Africa never materialized, Viola found other ways to share her passion about missions as a pastor’s wife and through serving Kansas-Nebraska Southern Baptists. Viola had been serving Kansas-Nebraska Southern Baptists for only about five years when Collins became ill and died. Devastated by the loss of her soul mate, she threw herself into her work. “I must have hit the ground running trying to escape from my loss,” she recalled. But God wasn’t finished with Viola—He opened new ministry doors for her. Her first trip abroad came in 1967 when she accompanied a group of youth to an international conference in Berne, Switzerland. This experience showed her what it was like to be a stranger in a foreign land. So God laid on her heart a burden to minister to internationals when she returned home to Kansas. After traveling thousands of miles and speaking in hundreds of churches in Nebraska and Kansas, Viola retired in 1982. 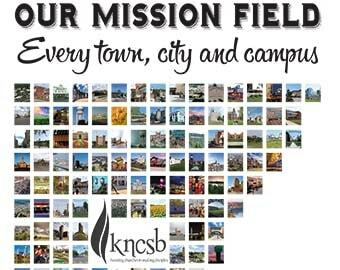 Kansas-Nebraska Southern Baptists voted to name their annual missions offering in her honor. Following retirement, she immersed herself in serving God through her church, First Southern Baptist in Topeka. Unfortunately, the years eventually caught up with her. In the mid-1990s, she had to sell her home and car, and move into an assisted-living facility in Topeka. As a woman who treasured her independence, this was especially difficult. A few years later, her health declined to the point where she had to go to a nursing home. Her body grew more and more frail, but her spirit seemed to become even sweeter. “I’m so thankful,” she often said. Her frail body frustrated her after a life of being strong and independent. Viola spent hours looking out the window of her room at the nursing home. She watched the cars travel up and down the street and recalled her many years of traveling for Kansas-Nebraska Southern Baptists. On Feb. 18, 2009, God called Viola home to heaven. She will be greatly missed. However, we can rejoice that she is in God’s presence with a new body that is strong and pain free. We can carry on her legacy by praying for missions, giving to missions, such as the Viola Webb Missions Offering, and doing missions around the corner or around the world.